This section presents some economic and social outcomes of Hispanic adults by their highest education attained. Labor market outcomes are examined for Latinos ages 20 to 64. A few non-labor market outcomes are presented for all Hispanics ages 20 and older. In the labor market, about two-thirds of Latinos with GEDs were employed, compared with nearly three-quarters of Latinos with high school diplomas. Hispanic adults with a GED had a higher unemployment rate (9%) than Hispanics who graduated with a high school diploma (7%). Hispanics with a high school diploma were more likely than Hispanic GED holders to be full-year workers (80% versus 75%). Although Hispanic GED holders are less likely to have jobs and full-year work than Hispanic high school graduates, the average Hispanic GED holder may be paid more than the average Hispanic high school graduate. Among full-time, full-year workers ages 20 to 64, mean earnings for GED holders were $33,504 compared to $32,972 for Hispanics who ended their education with a high school diploma (Table 1). This is a surprising pay finding. The typical GED recipient has finished around 10 years of formal schooling (Clark and Jaeger, 2006), two years less schooling than high school graduates. GED examinees do invest time to prepare and pass the tests. The median GED examinee devotes 30 hours to test preparation. But in each year of high school, a student devotes 410 hours to core curriculum classes, so the typical GED holder has not invested as much time in his or her education as a high school graduate (Boesel, Alsalam, and Smith, 1998). The higher average pay finding is found among only one group of Hispanic workers. Table 2 presents mean and median earnings for full-time, full-year Hispanic workers by gender and immigrant status. For native-born workers, high school graduates are paid more than those with GEDs. Among foreign-born workers, particularly foreign-born males, GED holders earn more than high school graduates. For example, median earnings for immigrant men who are high school graduates were $26,478, compared with $30,552 for immigrant men with a GED. 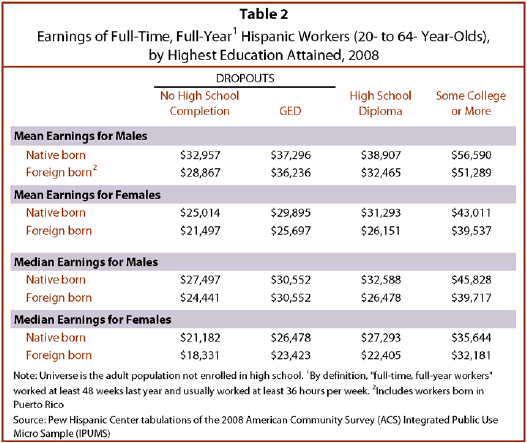 The earnings payoff to Hispanic male immigrants for having a GED rather than a high school diploma may be due to a number of factors. The male GED holders are about 2.5 years older, on average, than the male high school graduates, and they are less likely to have recently arrived in the United States. Also, although English proficiency is not a prerequisite for passing the GED tests, immigrant male GED holders are more likely than immigrant male high school graduates to be fluent in English. Fluent English speakers are paid more in the U.S. labor market (Bleakley and Chinn, 2003). However, it is possible that GEDs have a signaling value for male immigrants. Most of the immigrants arrived in the U.S. as adults, and those who are high school graduates received their diplomas from foreign secondary schools. Employers may have difficulty evaluating workers with foreign credentials. Immigrants with GEDs may be compensated for possessing a more familiar credential. 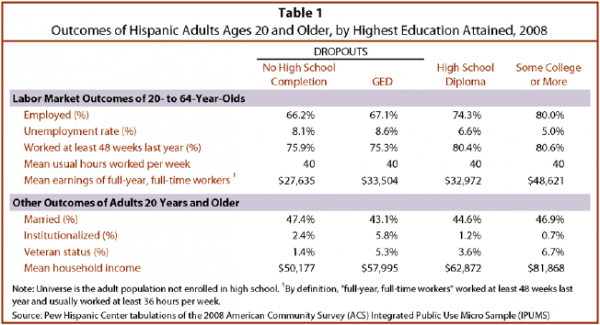 Hispanics whose highest education is a GED are much more likely to be currently incarcerated than are other Hispanic adults (Table 1).4 This partly reflect the fact that correctional facilities widely provide GED preparation and testing to inmates. Though less than 1% of the population is incarcerated, more than 10% of GEDs each year are awarded by correctional facilities (Heckman and LaFontaine, 2007).